N- and C-terminii could be joined via a peptide bond, i.e. alpha carboxyl to alpha amine. An example of such a homodetic cyclic peptide is cyclosporine A. The linkage could be made via side chains. There are examples of lactone linkages. Peptides cyclized through a disulfide bond between two cysteines, e.g. somatostatin and oxytocin, are common as are the bicyclic peptides where the ring formations do not involve the ends of the peptide. While cyclization via Cys-Cys seems to be preferred we can accommodate most strategies. 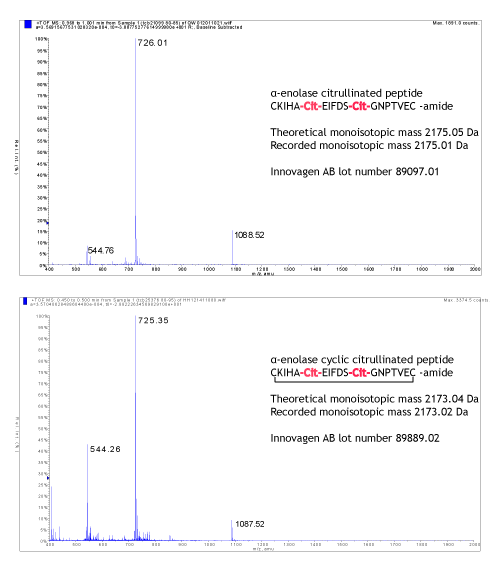 A note of consideration; Mass spectrum analysis is a standard means of quality control, which aims to confirm the theoretical molecular weight of the peptide. Many systems have an accuracy in the order of 0.1%. It may sound good, but if one considers that the difference between a linear peptide and its successfully cyclised version is 2 Da, then a better system is required in order to verify the presence of a disulfide bond. A high end mass spec such as QMS or its equivalent, where mass verification can be made at the monoisotopic level, delivers the kind of accuracy that projects like these require. Of course, peptides can be made with multiple intramolecular disulfide bonds, such as the defensin and LEAP peptides. Compared to the dual Cys containing peptides, the level of difficulty is raised considerably in the building of these multi S-S bridges. Where cyclisation is achieved by letting the disulfide bonds form spontaneously, preferably under optimal conditions, the bonding needs to be directed for peptides containing more than two Cysteines. This is done by the use of orthogonal protection groups, such that pairs of Cys can be deprotected and allowed to bond one at a time. Innovagen has serviced the research community since 1992. In that time we have been providing scientists with disulfide bonded peptides of various degrees of complexity. From experience, we know what being quality-minded in every step of the production means for the successful outcome. You will benefit from this knowledge when turning to us for your peptide requirements. Claire Marchal, F. Schramm, A. Kern, B. J. Luft, X. Yang, T. Schuijt, J. Hovius, B. Jaulhac & N. Boulanger. Antialarmin Effect of Tick Saliva during the Transmission of Lyme Disease.